When a business is starting out they have few employees and can easily handle payroll and human management processes manually or via spreadsheets like excel. With less than five employees the owner can calculate payroll and track leave via excel. As the business grows and hires more employees, performing human resource management processes manually becomes inefficient and takes a lot of time. As the HR manager continues to hire, the pile of CV's increase on their desks. Keeping paper-based record of employee details becomes complicated especially when you want to search for a given employee. With all records on paper, it's difficulty to understand the organization structure. In the spirit of keeping your employees happy, the HR manager might give salary advance and advance short-term loans to their employees, but the HR manager can easily forget to deduct these amounts at the end of the month leading to losses. At the same time, an employee might have worked overtime but the HR manager unintentionally forgets to remunerate the employee for the extra hours worked leading to employee dissatisfaction and reconciliation issue in the next month. Human is to err. Not only is processing payroll on spreadsheets prone to human error but also it's tedious to generate professional payslips with your company logo. Also, distribution of payslips by printing and giving out one by one takes a lot of time. Because of inherent flaws of running payroll on excel or manually, the business might not be able to generate statutory reports (NSSF, NHIF and ITAX) in time resulting in hefty penalty which will strain the business in an already competitive economy. Managing leave application via paper-based workflow takes a lot of time and there is no visibility on when the application is any given time. It gets complicated when your have supervisor who need to approve the leave application or the employees need to delegate their duties before going for leave. Also, calculating and tracking the remaining leave days manually can be a headache for the HR manager. It's because of these challenges in Human Resource Management, that SapamaERP.com HRM software seeks to solve. SapamaERP.com HRM software is a web-based Human Resource Management Software hosted on the cloud which i simplifies, automates, and streamlines Human Resource Processes of small and mid-sized enterprises (SME's). Our Employee Profile module enables you to securely and easily maintain a central database of all your employees with their bio-data such as photos and national identification number. Also, you can keep a record of your employee's contacts, dependents, next of kin, education background, work experience. It enables you to structure your organization and attach employees to different departments, locations and job categories. Thus, you can easily pull an organizational chart. Our comprehensive Payroll Processing Module is locally engineered to comply with statutory regulations and can generate for your NSSF, NHIF and ITAX reports or “by-products” as they are commonly know. These reports are ready for submission without any modification thus saving you time, enabling you beat submission deadlines and avoid penalties. HR managers can digitally record salary advances paid out and maintain a repayment schedule of loans advanced. The advances and loans are automatically deducted from the employees pay. Also, the HR manager is able to accurately pay the overtime and include it in the pay at the end of the month. On a click of a button, the HR manager or accountant is able to process payroll for multiple employees and generate corporate payslips that have the company logo. What's more, is that instead of printing, the HR manager is able to email individual payslips to each employee email address, thus reducing the time needed to distribute payslips. 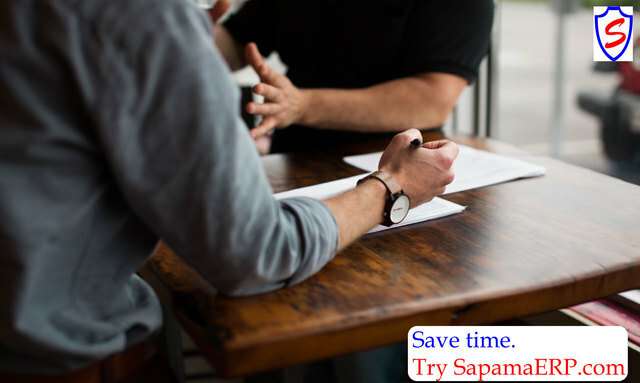 SapamaERP.com Leave Module 100% eliminates paperwork in the leave application and approval processes. Organizations can easily configure leave type such as annual, maternity, paternity and compassionate leave; and then entitle employees to these leave types. An employee logs in the self-service portal and apply for leave and can also delegate their duties to a colleague who has to accept responsibility. Then the leave goes through an approval processes where the supervisor or line manager then approves the leave. The software keeps an digital record and track of the remaining leave days thus no need to manually calculate the days. SapamaERP.com Self-service portal empower employees to login, update their profile, view payslips, download P9 forms, easily apply for leave, loans, overtime and advance securely online. This easier the work of the HR manager, democratize information and enables collaboration.